Lauren Gilstrap is a Realtor with Coldwell Banker United, Realtors in Columbia, S.C. Connect with her on twitter: @REALTORgilstrap or check out her blog. I have always been interested in real estate, and attending college in Charleston, South Carolina — with its beautiful, historical and architecturally defined homes — only reassured my passion. I started practicing real estate in September 2010, when the market was subpar. I had multiple people tell me I was “crazy” and others who said, “Yeah, good luck with that” when I excitedly told them of my career switch. But I made it! Here are my three top tips for how to get started in the real estate industry. 1. It will be hard to find new clients, especially if you’re new in town. When I moved to Columbia, South Carolina, in June 2010, I didn’t know a soul. I got my license and was eager to conquer the competitive real estate market, but found myself wondering, “How am I supposed to do that not knowing anyone?” I immediately started getting involved in the community — I found local organizations I was passionate about, attended college alumni socials, and immersed myself in all my time would allow. I also networked with the busy agents in my office and gained their trust. I was so thrilled when I found my first client from hosting my first Sunday open house for an agent in my office. The transaction went smoothly and I was ready for more, but I still struggled with being new. My lesson? Say yes to every networking opportunity that comes your way, and learn how to naturally bring up your occupation without sounding like you came only to sell. If you can, ask veteran agents (who may not want to take on new clients) to handle open houses or other events where you might meet new clients. 2. You will be questioned because of your age. Here’s how to combat it. The average age of a Realtor is 57 — I quickly learned that I was in the minority at age 25. So now, not only was I new, but young. I consistently struggled with the question, “Why would any person trust a “newbie” (and 20-something) agent with such a large investment?” I was so fearful of their questions: How many homes have you sold? How long have you been in real estate? What they were really asking me was: Do you know what the heck you’re doing? I had to learn to take these questions and turn them into self-assured, positive answers. Was I inexperienced? Yes, but I did join a well-known, top-producing office that I knew I could consult at any point if I had questions. I convinced people that though I was newer to real estate, I was young, energetic, passionate, and could dedicate more time to them unlike the agent who had 30-plus listings and numerous buyers. My lesson? Don’t let anyone make you feel inferior for being new or young. Pick a credible mentor in your office who’s willing to help you, and then dive in. You can do anything with confidence, determination and persistence. When I first started, I heard of some pretty unfortunate misunderstandings on what comes with the purchase of the property: Clients have misconstrued the inclusion of everything from appliances to family heirlooms to light fixtures. If you are the listing agent, make sure you and the sellers are on the same page about what comes with the house prior to the final walk-through or closing. When in doubt, always write it into the contract. Another rookie mistake to avoid: Remember that the closing attorney handles multiple real estate transactions per day and might mistakenly forget to add the closing costs or home warranty to the HUD-1 settlement statement. It’s important to always review the contract right before closing to make sure all contract terms have been accounted for on the HUD-1. Create a checklist to staple to the inside of a client folder and make sure everything matches to prevent minor slip-ups. My lesson? You can’t learn everything before your first transaction, but you will learn something new in every transaction that will make you a better agent. Take a moment after each closing to jot down what you could have done better. 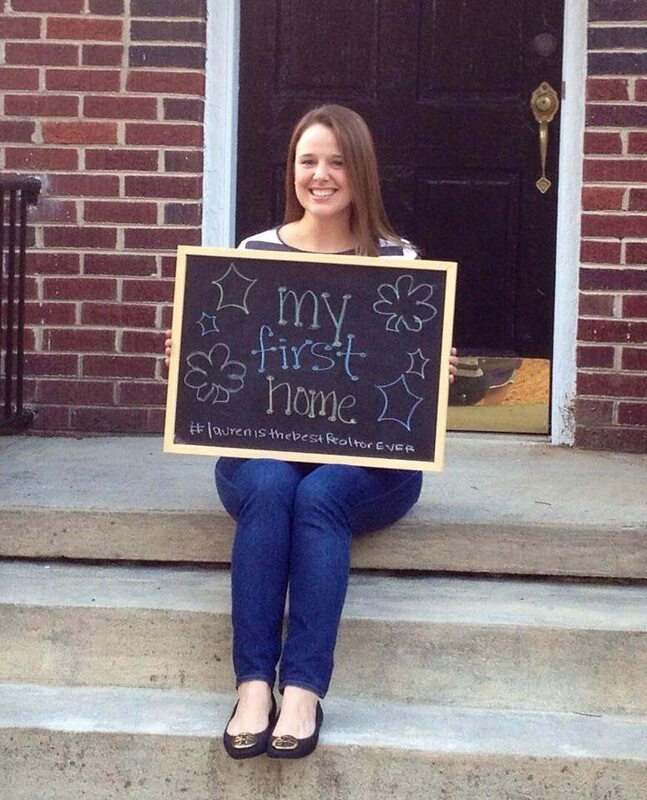 One of Lauren’s happy buyers poses in front of her new home. The first few years as a new agent are tough, and it’s easy to get frustrated when you can’t land a client or you don’t feel like you have all the answers. My best advice is to network as much as possible, and then value your clients once they begin working with you. Put their best interests forward, and you’ll build their trust and your business. There will come a day when potential clients approach you to ask, “We would like to work with you, do you have time to work with us?” and then you will smile to realize you will be just fine.